BestLiquidations.com – FROST 1190 & 1190-1 AUTO AIR HAND DRYER, HANDS FREE HEAVY DUTY, 14 GA. DRAWN STEEL, PLATED, BRUSHED METAL FINISH. 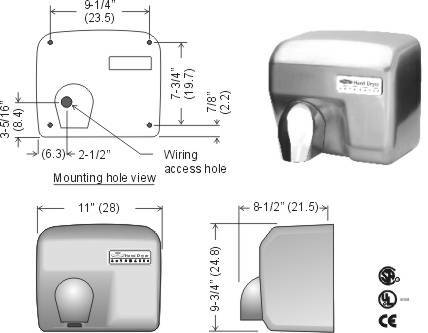 Frost 1190 & 1190-1 auto air hand dryer, hands free, heavy duty, 14 ga. drawn steel, plated, brushed metal finish 1190 come in 120 volt and 1190-1 comes in 220 volt. Materials: Drawn 14 ga. Steel, plated, brushed and laquer finished.